This is a home in Chester, MD on Cox Neck Rd. This was a waterfront home with a young family that wanted to have entertainment at their fingertips. They wanted a Theater Room with a giant screen with four TVs on the walls next to the screen along with an 11.2 or 7.2.4 surround sound system, TVs on the walls in every bedroom as well as the office, a whole house sound system with great sound (background music would not have been enough), and a reliable wifi connection no matter where they went on the property whether inside, or outside at the dock over 200′ away from the home. Needless to say, we were more than happy to help this lovely family with these projects. 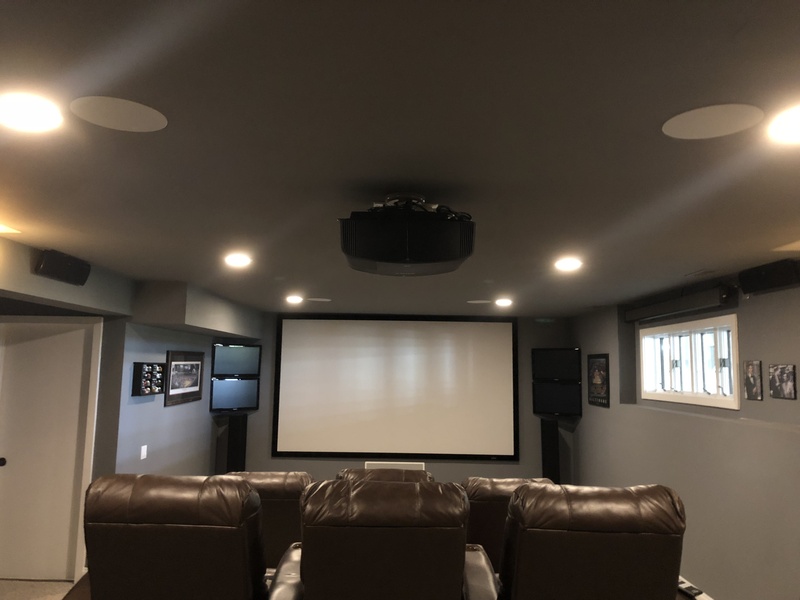 To start, we installed a great sounding and great looking theater room in the basement. This is an 11.2 surround sound system using 7 in-wall surround sound speakers, 4 in-ceiling surround sound speakers, and two 10″ subwoofers. These are Definitive Technology speakers, and the in wall speakers include a built in back box which means that it doesn’t use the wall cavity as the speaker box. This greatly increases the sound quality as well as the volume that comes from each speaker in your system. This system sounded incredible! We also installed a 135″ movie screen along with a Sony UltraHD 4K projector which produces an image quality that would blow you away. When this client saw the picture on this screen, he got the biggest smile on his face, reached in to shake my hand, and then pulled me in for a hug. It is the best feeling in the world when a customer is that happy with their system, and I get to have that feeling all the time! -A Luxul Wifi system with a wireless router, a Luxul indoor access point for the other side of the house, and a Luxul outdoor access point to send wifi all the way out to the dock. -TVs in the family room, sitting room, office, master bedroom, outside at the patio, and three kids rooms. -A whole house sound and automation system with Definitive Technology speakers in the kitchen, sun room, office, garage, patio, and deck. -We pre-wired all of these systems while the client was remodeling his house and we returned to install everything once the building contractor was all done.